Painting was an important part of savoring this recent India retreat with Jala. Twelve days at Basunti in the northern province of Himachal Pradesh offered the opportunity to briefly immerse myself in new colors, scents, flavors, traditions and India’s vast sense of space. The beauty and contrasts I observed were humbling. burning rubbish and Sumla’s smile. and the hidden ones I imagined were lucky in the bushes. and that lovely lilac sky. The watercolors in this show were done on site at Basunti. The acrylic paintings on board were done in Margie’s Providence studio but incorporate found elements from India. Margie is a painter whose creations span plein air, abstracts, collage and painted objects. Margie completed her MFA at the Art Institute of Boston and keeps a studio in her Providence home. In addition to art, she consults in the fields of brand strategy and community engagement. I find that through the act of drawing I am able to pursue fluidity, to experience the spontaneity of line, shape, and color, to move at my own pace. These drawings came to be about finding a sense of balance, a place where things feel right and unfold slowly. Through variations in hardness and softness of lines, juxtaposing sharp and smooth shapes, and working with negative and positive space I worked toward this sense of equilibrium in hopes that the result would bring some sense of peace. Emily Martin is a southern New Jersey native living in Providence, RI. She studied photography as an undergraduate at Stockton College and has since worked in the mediums of photography, design, craft, textile, and writing in her personal creative practice. ‘I am interested in exploring how order and beauty relate to peace of mind, through my art. This interest comes out of a need to organize and measure my own life with care, tenderness & vulnerability. The quest for stability in a world of movement and change is something I aim to address through photography, drawing, paper weaving and painting. I’m engaged in the dialogue between these mediums and how they enhance each other and can express the same sentiments in totally different ways, yet through a consistent way of seeing. I often feel that everything is loud, big and coming at me quickly, making me feel fragile as if I could disappear. I reference that feeling through all of these mediums, over the past 35 years of art making. Ruth Lauer-Manenti received a BFA in painting from The School of Visual Arts in NYC and an MFA in drawing, printmaking and painting from the Yale School of Art, where she later taught drawing and printmaking. She also taught drawing, painting, and printmaking at Dartmouth College. Ruth’s work has been exhibited at the Bill Maynes Art Gallery, the Lower East Side Printshop, John Michael Kohler Arts Center, Paula Cooper Gallery, The Griffin Museum of Photography, Dartmouth College and Le Salon Vert in Geneva, Switzerland. Ruth was a recipient of the 2016 New York Foundation for the Arts photography grant. "These days, as time allows, I am drawn to the sea, to bask in its restorative powers. I was raised on the water, the daughter of a sailor, and have always had an emotional response to the sea's energy. I paint from life, plein air, in locations which are imbued with peace and tranquility. In response to the elements, awash in color and light, I work to express this feeling of calm inspired by nature. My paintings are studies, impressions of a day, a location, a time of year, a moment, a memory." "This collection of collage paintings began with some trimmings from some larger abstract works I’ve been making recently. I have been collecting these “outtakes” and thought I’d save them for some smaller pieces. Instead of pouring more paints onto them in layers like I normally do, I began instead to use collage to create dreamy, playful landscapes and vistas. 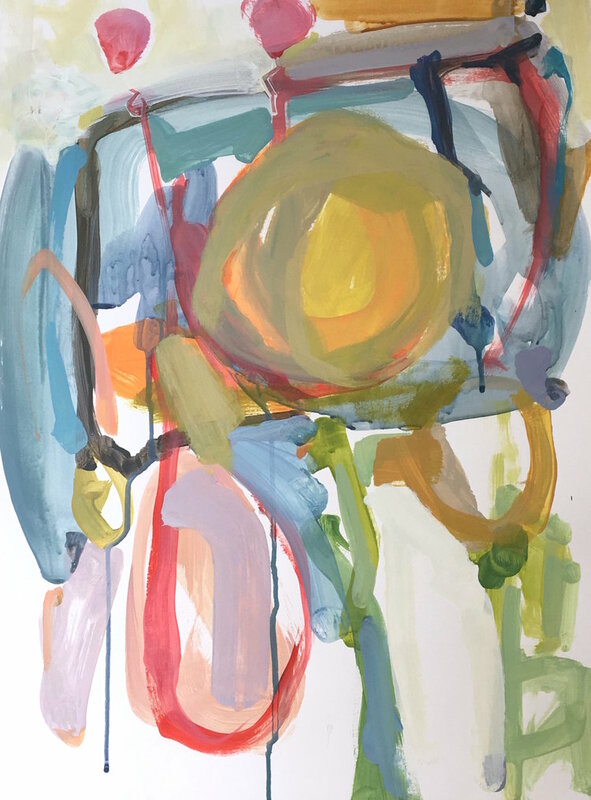 My work is very process driven -- for me, the joy in making art is witnessing the unfolding of imagery though expressive gestures using a variety of tools. I particularly like squeegees, spoons, and scrapers. With these pieces, it was fun to add to the painted backdrops, creatures, characters, and all manner of objects in a more methodical and planned way. I think there’s something mysterious, magical, and light-hearted about this group of paintings. I’m a long-time yoga practitioner, and feel like art making has similar qualities as doing yoga. As an abstract painter, there is an emphasis on creating forms and manifesting gestures in a variety of colors. Spontaneity is a big part of my work, but there is attentiveness, precision and focus as well. At its best, the process of making is deeply embodied, can offer other ways of seeing, and can be a transcendent experience. The end result just follows. For the most part, there is no real goal or specific picture in mind. It all just comes as part of the path of making – a fluid, mindful process that goes beyond the everyday." An Li Liu was born in Guelph, Ontario Canada and lived in Toronto for over a decade before moving to the US. She resided in Boston, MA for several years, and then moved to Berkeley in 2014. She attended the University of Toronto majoring in Cinema Studies and Religion. An Li also studied New Media Design and worked in the industry as a web and graphic designer. She is a traveller at heart having traversed much of South and South East Asia where colors and energies are very potent. An Li delved into yoga practices with a special interest in Buddhist philosophy and then became a yoga instructor herself several years ago, and taught in the Boston area. While An Li took formal art classes in University, she is mainly a self-taught artist with many influences — everything from sublime landscapes and atmospheres to city energy and our shared existential wonders and woes. "I paint my daily existence - flow, interruption, luminous moments and countless pivots.Ideas oscillate amidst the accumulation of color, shape and gesture. I allow myself to roam visually seeing which forms and relationships call out. My wish is to paint where the felt and the formal merge. Much like my yoga practice, the journey is one of continually starting over. Locating myself anew with what each day holds." Margie Butler is a painter whose creations span plein air, abstracts, collage and painted objects. She has exhibited in Providence, Cambridge, New Bedford, Connecticut and Keene Valley, NY. Margie completed her MFA at The Art Institute of Boston and keeps a studio in her Providence home. In addition to art, she consults in the fields of brand strategy and community engagement and practices Chinese foot reflexology. This installation of functional ceramic pieces is presented as an exercise in iteration and accumulation. Over the course of the next two months, the shelves will gradually fill with vessels that change incrementally from piece to piece, the spacing between them likewise intermittently expanding and contracting. The work embodies the concept of spanda as framed in Tantra yoga philosophy. This Sanskrit term has as its root spadi, meaning “to move a little,” and is used to describe the microcosmic pulsation of universal energy made manifest in tangible form. The installation mirrors this essential dynamism of stillness, potentiality poised in the contained space of each vessel. Max Ascrizzi believes in the seed, in the sleeping ember, in things just out of sight, unseen, the hidden forces beneath the surface. He believes in the homologous relations (in the often divided view) of Humanity and Nature. Born in 1971 to Artist parents, Max Ascrizzi was raised in Freedom, Maine, a small town, just inland from the coast. Max basically grew up between the outdoors (in the woods that surround the house and gardens that his parents built by hand) and his Father's shop/studio. It was knowledge acquired in these two places that taught Max all the skills he uses in the making of art and furniture. He has designed and made furniture which he has shown in galleries and furniture shows, has taken commissions to design and build original pieces. He has also produced several multi-media performance pieces, and has shown his art in group and solo shows. Fritz Dumville is a sculptor and graphic artist who follows the archaic language of line and form; laid down before the first alphabet, untainted by intellect, and vessel of pure feeling. Life Lines features Dumville's composite prints and selected works of sculpture. The liveliness and sensitivity of Dumville's work visualizes a depth of feeling found in both the prosaic and profound. Fritz is Detroit born and Providence based, with decades of experience in teaching and editorial illustration. "All his figures are very human, touchable, connectable, fragile, and yet very strong at the same time. Fritz shows their vulnerability and beauty in everyday moments, movements, and encounters. There is something subtle and deep within his perception of bodies, the lives of different people and their interconnectedness. Sometimes his figures are humorous, like birds reading news papers. Sometimes you see sobbing girls, showing strong emotions. In the Bhagavad Gita it says, that through the practice of yoga, we learn to see the divine spark in all beings and at all times (BG 6.29). Fritz captures these divine sparkles beautifully in his art works and in all the beings he brings to life. Being close to Fritz's art you can feel their love and connection. natural indigo dyed paper on paper, 26" x 20"
Riley will be presenting a series of new works that reflect on the transformative properties of water. Using paper and a dye bath of natural indigo, Riley is seeking to realize the dual nature of water as a constructive and destructive force by finding a point of balance between these forces. The paper, as a result of its interaction with water, becomes a memory, enriched by the calming blue depths of natural indigo. This series of works stems from Riley’s recent work in textiles, in which he has methodically deconstructed blue jeans inherited from his father. Working with inherited clothing has brought his attention to how memory is preserved and communicated through material and we as humans embed our own personal narratives into objects. Sean Riley lives in Providence, RI and works form a studio at the Hope Artist Village in Pawtucket, RI. He has just been awarded a 2017 Fellowship in Crafts for his work in deconstructed denim from the Rhode Island State Council on the Arts and this past spring he was a resident at The Joan Mitchell Center in New Orleans, LA. Riley is a new and enthusiastic yoga student at Jala Yoga & Arts. As part of his exhibit, Memories in Indigo, Sean Riley will be presenting a new performance artwork at Jala Studio. Blue of a Thousand Years will use poetry, music, video, and movement to create symbolic acts of transformation that relate to Riley’s work with indigo in relation to memory. The performance will also act as a memorial to the work of artist, Terry Adkins (1953-2014.) Riley studied under Adkins at the University of Pennsylvania from 2002-04 and worked alongside him for many years as an assistant and collaborator. According to Riley, "Terry taught me how to listen to materials for what he called their 'potential disclosure', by which a material reveals how it may be transformed and given new purpose. Terry was a master at this and I am forever grateful for his wisdom, generosity, and mentorship." The title of the performance refers to a Japanese term for the deepest shade of indigo blue, attainable only by repeated immersion in the dye. For Riley, the intellectual and emotional depth of Adkins’ work has provided a model for artistic development and material transformation akin to such a saturated blue. The sewn images and delicate sculptures of S. Hollis Mickey are evidence of ritual transformations. Through slow, careful processes, simple materials become charged-- maybe even magical-- objects. 'From one to another' brings together sculpture and embroidery from the past two years, including many new pieces which have not been previously shown. Much of the new embroidered work was created over a two-week artist residency at Penland School of Crafts in the mountains of North Carolina. Having taught yoga for many years, Stephen Bethel brings the yoga teacher's gaze to the weight, balance and lift of the poses in his drawings. Having practiced yoga for many years, his body knows these poses by feel, from the inside. In the act of drawing, Stephen lets his hand be guided by his outer sight and inner sight together. The plaster pieces give a look into a longtime exploration of rounded and folded picture planes. Stephen Bethel studied fine art at Yale University, where he was also introduced to yoga. The two practices have formed an intertwining path. drawings and wall shapes is an interpretation of the different components of yoga—of mental and physical aspects. The process of making these drawings is slow and meditative. Each line builds upon another and ends in a culmination of thoughts. The wall shapes reflect fluidity, balance, and playfulness. Zach Martin is an artist from New jersey currently living in Rhode Island. He works with many materials, often developing unique ways to finish and form them. His objects are thoroughly worked and rehearsed, requiring constant attention until they are prepared and ready to view. Zach and his wife Emily Martin also started Interior Theatre, a creative practice playing with the character of objects made for the home, the body, and spaces in between. The body of work entitled Nidus (“nest”) is a single chapter in a vade mecum, and represents the culmination of a process sparked by Antonio Forte’s fascination with physics and Zen Buddhism. Japanese Zen calligraphic techniques (like the gesture used for the ensō, or “circle”) were used to create oil paintings and ink drawings. Realizing that light (color) and sound (music) are both waves of energy moving through a medium, being perceived by the human physiology and psychology, Antonio wrote a physics formula to translate the frequencies of light in the colors of paint into frequencies of sound. These frequencies were then used to create musical compositions. Antonio Forte studied Fine Art at SACI in Florence, Italy. He holds a BA in Music from American University, in Washington, DC, where he also studied Sculpture. Antonio is on faculty at the Rhode Island Philharmonic Music School where he teaches music composition and piano instruction, and teaches 1st through 8th grade music at Quest Montessori School in Narragansett, RI. He resides in Providence, RI, and is a member of The Wurks. Antonio uses the vade mecum as a vehicle for carrying out visual and sonic processes which examine the minute and fleeting intersections between temporality and spatiality. These intersections are what one may call “moments,” and are instances of change in both time and space. The vade mecum, or “go with me” in Latin, is a personal reference book that is regularly carried around by a person, and is the conceptual precedent and starting point for most of Antonio’s work. Each drawing, painting, sculpture, or musical composition he considers to be a single word, sentence, page, or even an entire chapter, within the confines of a larger entity that is both introspective and interpersonal for its creator. Kate Champa has been a ceramic artist and teacher for many years. The presence of the ocean in Rhode Island and the many moods, colors and terrain variations often inform her work. She loves color and form and the various interactions (sometimes intentional, sometimes fortuitously accidental) that occur between them. Animals in their infinite variety and capacity for joy are very important to her and she enjoys capturing their playfulness in clay. The perception of nature starts her own energy and creativity, the work finds its completion through the fire energy of the kiln. As yogis we understand our own fire energy: the alchemical processes of yoga use heat, breath and intention. This tapas transforms our bodies. Physically, we become firmer yet more supple, but the most profound changes occur in our subtler energies. We refine our energetic, emotional and intellectual bodies allowing our prana or life force to move unimpeded through our system. This free movement of energy helps us to feel more expansive, spacious and at ease. Our bodies become vehicles for intention and consciousness. The transformation of unformed clay into a ceramic artwork is also a process of tapas. The heat of the kiln and the vision of the artist forms the work – an artistic expression visualizing intention. Kate Champa has a Master’s Degree in Art History from Harvard and later attended RISD as a Special Student in Ceramics. Kate lives in Providence RI with three cats. Animals in their infinite variety and capacity for joy are very important to her. She has been a member of The Foundry Artists’ Association for 25 years. In 1997 she, with a group of local ceramic artists, started Raku Rhody-o, A FireArts Festival in downtown Providence. Under Kate’s coordination, Raku Rhody-o was for eight years a successful and exciting contribution to the R.I. art scene. With her raku kiln she has taught the ancient Japanese art of Raku firing at many high schools in Rhode Island. Kate is included in the Rhode Island State Council on the Arts list of Artists in Education. She is always available to teach ceramic workshops in schools and for other groups. Her work may often be seen at South County Art Association, other local galleries, and every December at The Foundry Show at the Pawtucket Armory Art Center. The textured texts and textiles of S. Hollis Mickey emerge at the intersection of actions and objects. Gesture and material traverse and transform one another through a process of making that is a kind of call and response across genres. Performance produces soft, densely stitched and marked textiles, and, in turn, textiles inspire, or are used in, performance. In a sort of poetic alchemy, action and object become entwined and inseparable. Small movements and evanescent materials gather meaning through repetition and accumulation. Thousands of hand-stitches produce an image. Bone is cyanotyped onto fabric-- shadow marks fabric like memory. Words are repeated over and over until they are sewn into material form. This alchemy takes time, patience, some residue of belief. The two large textile panels "Returning/Working panel" and "Shadow Osteology panel" are the result of two durational performances, but stand as objects themselves without the context of performance. The creation of the small embroidery "Release the animals or at least gives them names" has inspired a set of texts and performance events around wolf mythology that is the focus of Hollis' current work. S. Hollis Mickey is an interdisciplinary artist living and working in Providence, Rhode Island. Through text, textiles, sculpture, installation and performance, her work seeks to capture and remember ephemeral, everyday moments-- those glimpses of finding the extraordinary in the ordinary. Hollis was awarded the 2015 Rhode Island State Council on the Arts Fellowship in New Genres. She holds a BA and MA in Performance Studies from Brown University. In addition to being a practicing artist, Hollis works as Associate Educator, Academic and Public Programs at the RISD Museum, where she manages courses for adult audiences and artist professional development programs, serves as an editor of the Museum’s journal Manual, and teaches from the collection. She is also honored to teach at Jala and be a part of such a dynamic, creative, and intentional community. Jala features 'Pine Family 1' by British artist Jacqueline Brown. In her drawings, installations, videos, and sculptures, Brown turns an inquisitive eye on nature and its strange formations. Brown's training as a sculptor emerges at the forefront of her large drawings of conifer trees. The artist takes photographs in the forest of a seemingly infinite hatch of foliage, then "edits" her footage - effectively sculpting the material - into peculiar shapes that are then drawn on paper in painstakingly exquisite detail. Even here, seemingly undisturbed nature is not allowed to rest; rather, it is the artist herself who intervenes, mimicking an act of God through her re-structuring of flora. Through her sculptures, video, and extensive drawings, Brown's voyage as an artist has been spurred on by an inquisitive curiosity as to the ways in which we interact with the world we have inherited. Jacqueline Brown (*1982, Oxford, UK) studied at the Royal College of Art in London (MA Sculpture, 2007) and the Winchester School of Art in Hampshire (BA Hons Fine Art Sculpture, 2004). Her work has been exhibited throughout the UK and abroad. In 2007, she was short-listed for the Bloomberg New Contemporaries. That year, she also took first prize for short film at the Totnes Short Film Festival. Brown currently lives and works in Berlin. 'Pine Family 1' is accompanied by a Providence store front glass painting from the 1960s. This piece found in a former clothing store downtown shows in a clear geometrical structure the five koshas or bodies of the human nature as defined in the yoga tradition. Body, mind and spirit are interconnected, interrelated and interpenetrating, as it becomes visible in the interwoven grasp on nature in Brown's drawing. Jala features colored pencil drawings by Johannes Einfalt. The small works are extremely detailed. Their textured surface gives depth to the images, inspiring us to look deeper. These drawings examine traveling. In particular, the aspect of traveling where time seems to stand still and the journey momentarily becomes apparent as our destination, the experience itself. As the world passes through a windshield, we gain presence. We’re moving fast but time stands still. Landscapes pass in a flow field. Traveling keeps you apart and brings you together at the same time. Your subjective is strong, while you sometimes feel yourself dissolve… as long as you keep practicing. Johannes Einfalt lives and works in Berlin. He studied New Media Design at Merz Akademie Stuttgart and is represented by Strzelski Gallery, Stuttgart. International solo and group exhibitions since 2003. He specializes in drawing and creative writing. Jala is pleased to show the work of Jessica Kung Dreyfus. Jessica is a Chinese American born in New York City in 1981. She studied Architecture and Art at Yale University, and also studied abroad with Cornell University in Rome. She graduated with honors from Yale in 2004. Her work straddles the disciplines of art and architecture. Primarily through the medium of drawing, she explores how the Eastern tradition of the energetic body informs our experience of body, building, and urban environments. Through her work, she brings together her rigorous training in western art and architecture and her equally rigorous training in eastern philosophy and methodology to create a new paradigm. Jala features Jessica’s screenprints of yoga postures with watercolor and pastel overlays as well as originals and prints of Jessica’s line drawings.